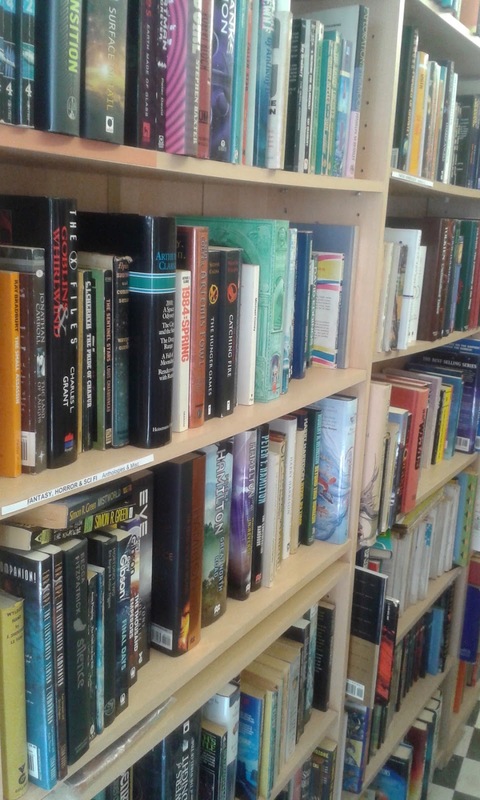 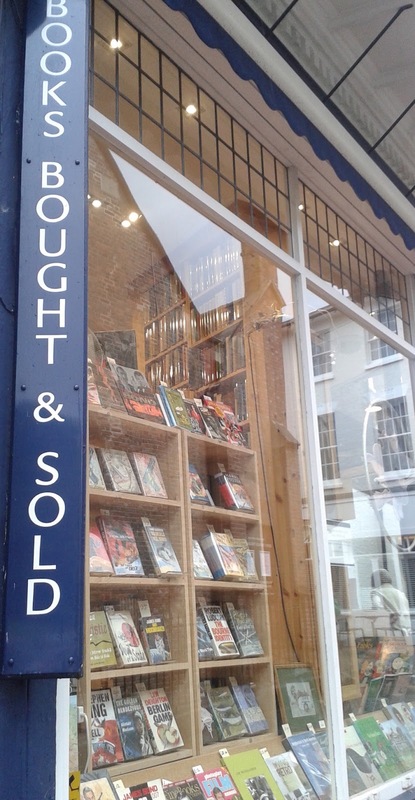 The science fiction (primarily hard SF and space opera) book collecting odyssey begun in March of this year – in Lewes and thereafter pursued with vigour variously in London, Eastbourne, Chichester, the Isle of Wight and Brighton – has proceeded apace, with additional stops in, among other places, Worthing, Leigh-on-Sea, Tunbridge Wells and, naturally, Lewes and Brighton – those last two being my 'manor', so to speak. 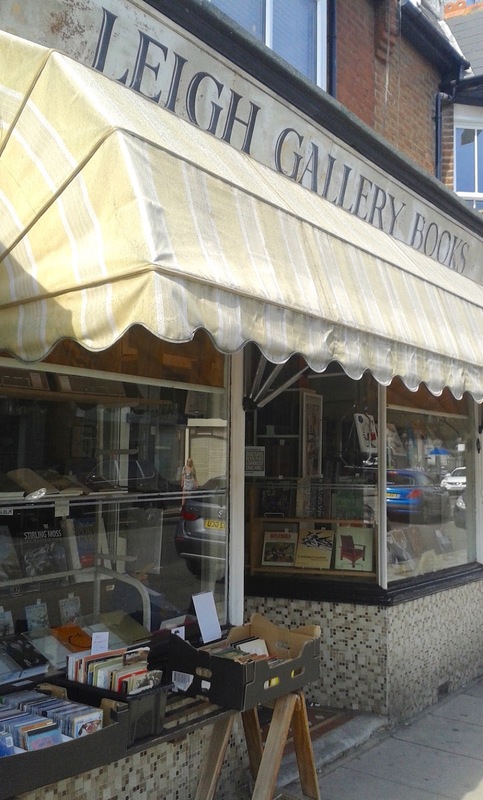 The Worthing excursion, which took place in June and was combined with a mooch around a handful of seafront gaffs with my mum, Rachel and Edie to look at paintings and sculptures and photography and suchlike on the annual Worthing Artists Open Houses trail, was to the reliable Badger's Books (where I once purchased a signed Victor Canning first edition), the bijou science fiction section of which produced literally a handful of books. Clutched in my filthy paw there I have a 1976 New English Library paperback of Christopher Priest's first short story collection Real-Time World (with a cover by, I believe, Bruce Pennington); a 1987 Futura paperback of Kim Stanley Robinson's early novel The Memory of Whiteness; a 1980 New English Library paperback of Bruce Sterling's debut novel Involution Ocean; a 1975 Eyre Methuen first edition of Alfred Bester's Extro, alias The Computer Connection; a 1977 Heinemann first of Fred and Geoffrey Hoyle's The Incandescent Ones, and 1979 Millington firsts of Piers Anthony's Vicinity Cluster and Kirlian Quest, books one and three in the author's Cluster series. 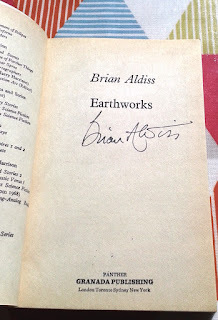 Those visits produced books by, among others, Gregory Benford and Larry Niven (a 2015 Titan paperback of Shipstar, the sequel to their Bowl of Heaven), John Brunner (a 1974 New English Library paperback of The Dramaturges of Yan), Joe Haldeman (a 1992 New English Library first edition of Worlds Enough and Time, the third book in his Worlds trilogy), Ken Macleod (2001 and 2002 Orbit paperbacks of Cosmonaut Keep and Dark Light, books one and two in his Engines of Light series), Paul McAuley (a 2015 Gollancz paperback collection of his Confluence trilogy), Loren J. McGregor (a 1987 US Ace paperback of The Net), Naomi Mitchison (a 1976 New English Library reissue of Memoirs of a Spacewoman), Richard Morgan (a 2007 Gollancz first edition of Black Man, which was the book I couldn't stop thinking about and went back for the next day), Keith Roberts (a 1972 Panther paperback of The Inner Wheel) and Kim Stanley Robinson (a 2012 Orbit first edition of 2312). 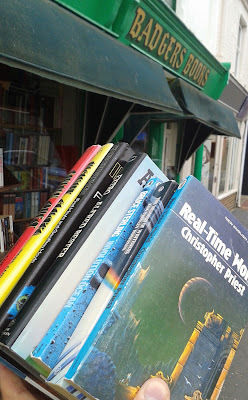 The 'among others' were probably the more interesting books of the haul; more interesting to me anyway – your mileage may vary – but in any case those were the ones I was more inclined to go to the trouble of photographing. Top row, left to right: a first edition of Piers Anthony's debut novel Chthon (MacDonald, 1967); a first (ex-library) of John Paget's (alias John Aiken) World Well Lost (Robert Hale, 1970), another of those intriguing Hale SF books I've been picking up here and there; a first hardback edition of John Brunner's Times Without Number (Elmfield Press, 1974), jacket by Josh Kirby; a first of Cordwainer Smith's The Rediscovery of Man (Gollancz, 1988), jacket by John Avon. Middle row, left to right: paperbacks of John Varley's short story collection The Barbie Murders (Futura reprint, 1986) – which contains some of his Eight Worlds tales – and novel Millennium (Sphere, 1985); a paperback first of Gregory Benford's Across the Sea of Suns (Orbit, 1985), second in Benford's Galactic Centre saga; a paperback first of Murasaki (Grafton, 1993), a shared world anthology edited by Robert Silverberg and written by Benford, Greg Bear, Poul Anderson and others. 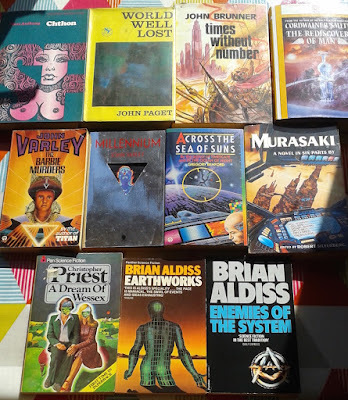 Bottom row, left to right: a paperback first of Christopher Priest's A Dream of Wessex (Pan, 1978), his fifth novel; and paperbacks of Brian Aldiss's Earthworks (Granada/Panther, 1979, cover by Peter Goodfellow) and Enemies of the System (Triad/Panther, 1980), both of which are signed. 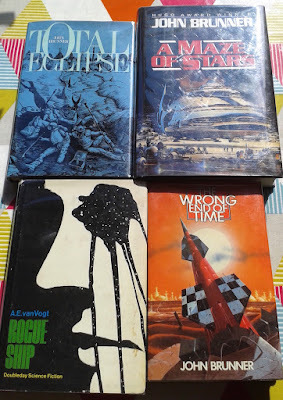 A British first edition of John Brunner's Total Eclipse (Weidenfeld & Nicolson, 1975); a US first edition of Brunner's A Maze of Stars (Del Rey, 1991), jacket by John Berkey; a British first of Brunner's The Wrong End of Time (Eyre Methuen, 1975), and a US first of A. E. van Vogt's Rogue Ship (Doubleday, 1965), jacket by Peter Rauch. 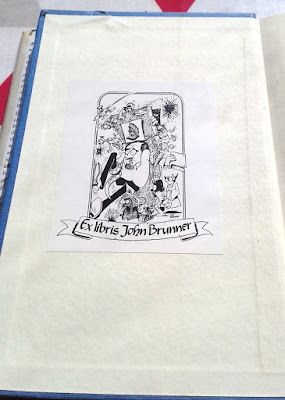 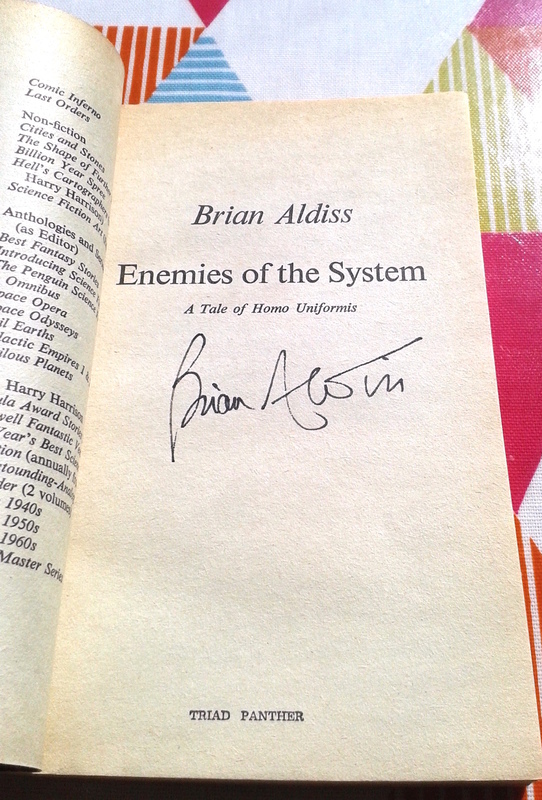 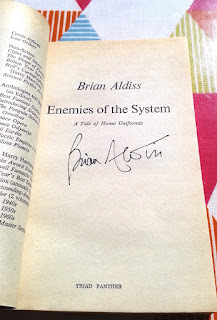 Two of the Brunners, Total Eclipse and A Maze of Stars, are the late author's own copies, both bearing his 'ex libris' bookplate on their front pastedowns. (The Wrong End of Time may well be Brunner's own copy as well, but it doesn't have a bookplate.) 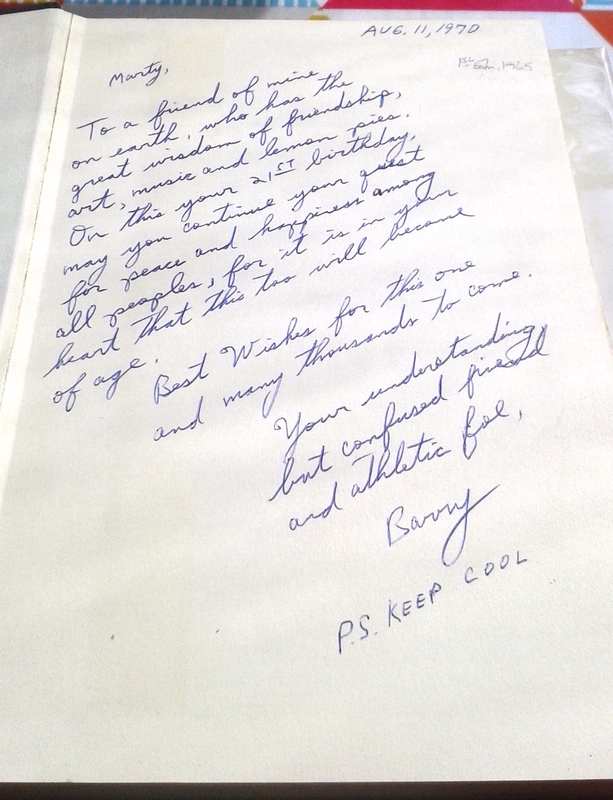 The van Vogt, on the other hand, has on its front free endpaper a heartfelt 21st birthday inscription (non-authorial) to a Marty from his "understanding but confused friend and athletic foe, Barry," who also advises Marty to "keep cool". 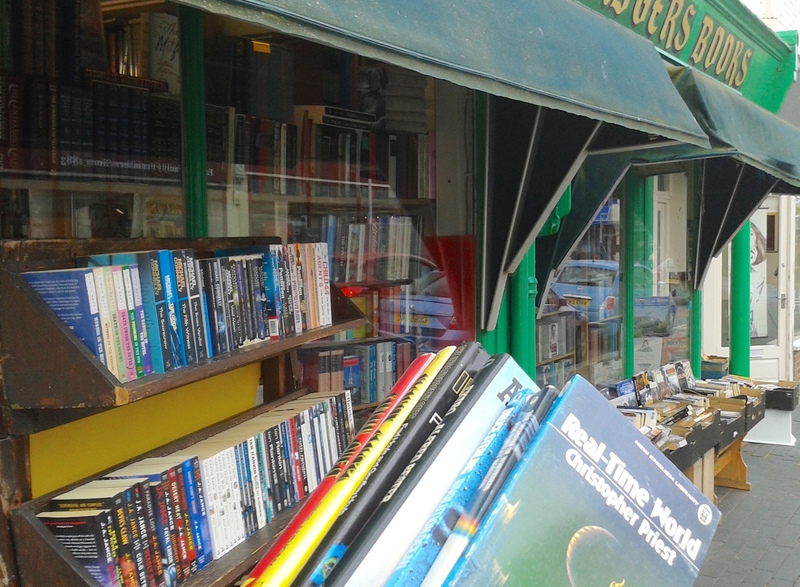 As for the wares from Lewes and Brighton – and other such exotic locales – I think I'll save those for another post. This one's quite long enough as it is.